ActiveFax has been designed for network-wide transmission and receipt of fax messages, as well as sending and forwarding fax messages by email. The software runs on any Windows version from Windows 95 or higher and also supports terminal servers (included Citrix). Due to the client/server architecture of ActiveFax, all data is stored centralized on the fax server. With the integrated fax client and the ActiveFax printer driver, faxing from any standard application is as easy as printing. 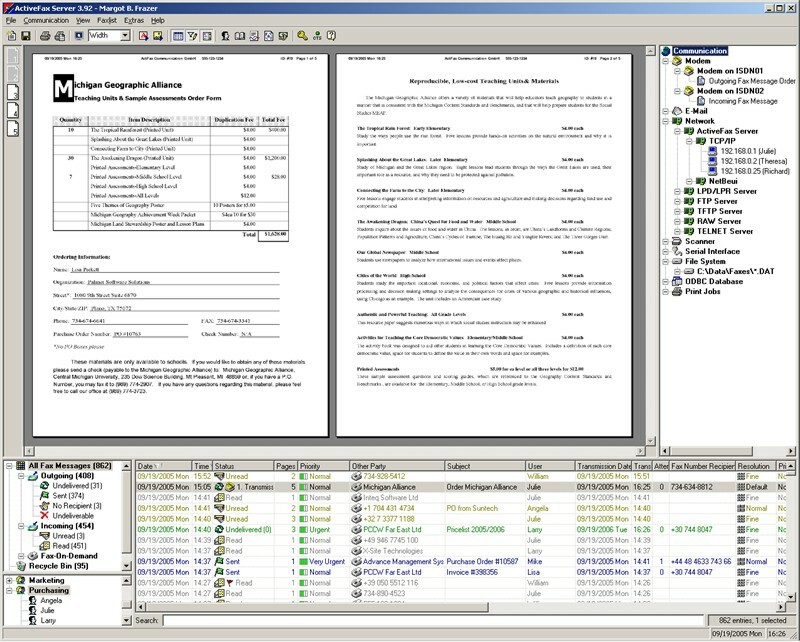 For the integration of the fax service into own applications, ActiveFax offers various standardized interfaces. The criteria for the price is the amount of users connected to the server at the same time. If you are running ActiveFax on more than 1 server, you will need a license for each server. Due to the intuitive user interface (see screenshot), the installation and configuration of ActFax is done in just a few minutes. Since ActFax automatically detects and configures the available hardware, the fax server is ready for operation right after the installation. ActFax is also available for free download through the download area for in-depth testing. A detailed overview of all features and functions supported by ActFax can be found in the features and functions summary below. Sending fax messages with ActiveFax is as simple and fast as printing a document on paper. To fax or email a document with ActiveFax, choose the printing function in your application as usual and select the ActiveFax printer as the destination printer. ActiveFax now displays a dialog window asking for the recipient (or a list of recipients) of the message on the screen. Central and private phone books assist the user in that case. ActiveFax now transfers the document to the fax server that automatically stores the fax and transmits it as fast as possible, depending on priority and available fax lines. For failed transmissions, the call is automatically repeated using sophisticated redialing techniques. The owner of the document can be informed about the result of a transmission with automatically printed sending reports, email notifications or through a popup window on the fax client. Through the integrated programming interface, ActiveFax easily integrates with other applications to send fully automated faxes and emails. The integration into own applications, for example to automatically fax purchase orders or order confirmations, can be done with very little effort. By using so-called data fields, all kind of information (i.e. the fax number, subject, priority, etc.) can be specified directly in the document. Because of the underlying concept of data fields, the programming language used for an application becomes unimportant. Data fields can thus be easily integrated with virtually every type of application, regardless of the programming language or operating system used. Due to the client/server architecture of ActiveFax, all documents are available for all users on any workstation in the network. Depending on the permission and group membership of a user, access is only granted to permitted documents. Extension numbers can be used to automatically route incoming faxes directly to the users in-box. Automatic printing on a particular workplace printer and automatic forwarding of received faxes by email can be individually configured for each user.